Plane spotting is a great way to learn about and enjoy the aviation industry and the aircraft and airlines that encompass it. For anyone who enjoys airplanes, plane spotting makes a great hobby. Whether you're interested in becoming a plane spotter yourself or you're just intrigued by the endeavor, the information in this article should help you understand the nature of the hobby better. And when you're ready to begin plane spotting, hopefully, this information will help you get off to a good start. Why do people stand around watching airplanes, anyway? The answer to that is a simple one, really: Plane spotters like airplanes. With that said, there are different types of aircraft spotters with different tactics and goals. Some aircraft spotters record the registration number (also called the N-number) of every airplane they've ever spotted in an attempt to log as many as possible or to remember which aircraft they've spotted. Others photograph as many aircraft as they can, paying attention to the different types and liveries, and sharing their photos in online communities. Aircraft spotters sometimes make it a goal to spot every airframe or type of livery from a particular airline. And still there are others who like to watch airplanes fly overhead without regard to the operator or type of aircraft. Plane spotting is as simple as going to the nearest airport and watching airplanes. (Really, it is!) There are certain unwritten rules and guidelines to follow in order to keep the peace with airport management personnel and other plane spotters, but for the most part, all you need to do to get started is watch and, if you'd like photograph airplanes. 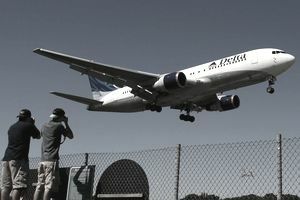 Long-time plane spotter and NYCAviation owner Phil Derner, Jr., suggests looking online for plane spotting information. "You can find out more about plane spotting in your local area by starting your search online. Or, you can research and ask questions on the message boards at NYCAviation." If you can find other spotters in your area, don't be afraid to ask for their advice. They'll be able to tell you the do's and don'ts for the local area and can share advice on how to get started. Finding a place to go can be difficult for beginners. But you can legally spot aircraft from just about anywhere. "Plane spotting is perfectly legal if you're on public property and not in a restricted area," says Derner. "Some private property owners will allow aircraft spotters, too, but they obviously reserve the right to ask you to leave if they wish." Derner warns that no matter what, cooperating with local authorities is important. "If airport security personnel or local police ask you to leave, then you should leave. Whether they are right or wrong, it's best to cooperate. You can always seek legal advice later if you feel that your rights were violated and you want to take action." Once you've found a location, you can begin looking for aircraft. But how do you know what to look for? There are a lot of options here. First, you can always just sit and watch without really looking for anything in particular. But if you want to take plane spotting a step further, you can join the ranks of experienced plane spotters and learn to identify aircraft. When identifying aircraft, you'll look for distinguishing characteristics such as the registration number, size, engine location, wing shape and paint scheme, to name a few. You can also search for a particular aircraft that is supposed to arrive or depart, based on a public flight plan database like FlightAware, where you can track flights and determine the departure and destination airports for most aircraft. The equipment you find necessary for plane spotting will depend on your own personal preference for how you want to spot aircraft and what you wish to do with your new hobby. You can use a sheet of paper or a computer database to log aircraft information, for example. Or, if you plan to take pictures, you'll probably want to invest in a decent camera and lots of memory cards. Many plane spotters have additional equipment that assists in finding and tracking airplanes. A transceiver is helpful for listening to communications between air traffic controllers and aircraft. Sometimes an ADS-B receiver is used to locate aircraft. At the very least, you'll want a chair, a good pair of binoculars and an aircraft spotting guide to assist in identifying airplanes. There are certain unwritten rules for plane spotting. Some are common sense, and some are discovered as you go. Climbing or touching the airport fence or messing around with airport lighting systems aren't allowed, for example. Some airports also have very specific rules about photography and will only allow spotters in designated areas. In general, remember to be considerate of the airport, property owners and other spotters. Plane spotting is a simple hobby that's available to virtually everyone. For more information about plane spotting or to view aircraft spotting guides, visit NYCAviation.com.